Hi Des , this grey scale picture was taken on when ? It is concerning to see the blue image on the bottom . That’s taken from a AVSForum member on his flagship NX9. It seems like the new JVC N series projectors continues with bad QC control...now there is this halo effects (blooming) of white object against a black background on some N5 models. While this is not something uncommon for "blooming" to occur for some JVC projectors, it is a concern for new models since the N series sports a new 4K panel and things should improve from one iteration to the next. In addition, there is also this "ghosting" effects which are fairly apparent against a black background and the "ghosting" moves in tandem with the mechanical IRIS. Hopefully this is only one or two defective units that we are looking at and not something that will affect the whole production chain. I have a JVC NX-5 up and running, do message me if you guys want to take a look at its picture quality! No problem, will compare with my previous projector as well. Can share what is previous PJ ? I am currently using 4k eshift 5 PJ. From what I gathered current N has worse contrast, worse brightness and black level , polarizing issues in 3D while some units have image artifacts but it is clearer and lack of eshift noise due to native panel. Please share your findings bro. My advice, if you are currently using the last generation X series JVC projectors with 4K eShift 5, then probably you may want to wait for the next generation of the N series to get a more “significant” improvement to the overall picture quality. For those interested to see the new JVC N7 in action, I will be setting aside 3 hours to showcase this projector this Sat (2 Mar) from 1pm to 3pm at my place. I will talk about the good, the bad and other things in between, I will also be touching on the HDR and auto tone-mapping for this projector...and last but not least, sharing my thoughts in general. As the session will be focusing more on the projector itself rather than the audio aspect of home theater, I will allow a max of 2 members for every hourly session. Only 2 seats avail in my small man-cave. Take note, this is NOT a sales pitch for JVC as JVC didn't pay me a dime for this demo, it is purely a sharing session between home theater enthusiasts. For those interested, drop me a PM and I will get back to you. My apologies to the 2 members. Due to last minute family matters that cropped up that requires my attention. I regret to inform that tmr session will be cancelled till further notice. For those who are getting the new N series (regardless of the models you picked), do take note that the advertised auto mapping feature is far from ideal. 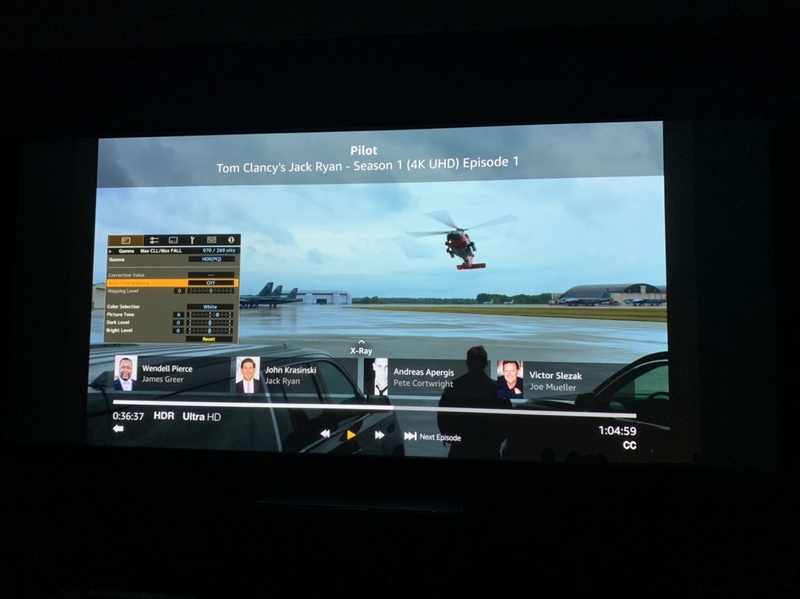 There are simply too many variables at play; be it the metadata MaxCLL/MaxFALL from the Display Master Info on the UHD 4K titles itself or the streaming app like Netflix or Amazon Prime Video. The “auto tone mapping” feature is unable to provide a consistent image quality every time we change to a very different source. Almost certainly that one will need to meddle with the tone mapping options like picture tone, dark and bright details control to get the best out of each sources. 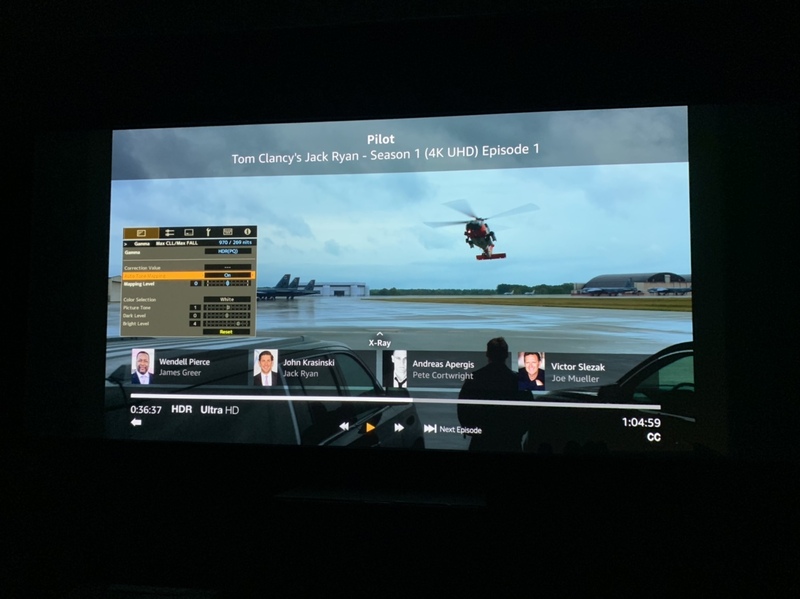 The only viable solution for the new N series projectors seems to be the use of dynamic metadata instead of the poorly implemented static metadata that HDR10 provides at this point. And one of the solutions is to use MadVR which does analyse each frame in the movie scenes to produce the required nits (brightness) and contrast (shadow details and perceived blacks) and this require us to use HTPC. Coupled with some stating that these new N series JVC projectors will not receive a firmware update to accept the new HDR10+ metadata, it is a regrettable limitation as these projectors can actually produce very good HDR images if the auto tone mapping feature works “dynamically” to analyse each frames instead of relying on a static metadata. Here's a look at JVC N7 auto tone-mapping. The scene here is from the Pilot episode of Jack Ryan in 4K HDR playing on Amazon Prime Video. The source is from nVidia Shield TV 4K. Can you spot the difference? With auto tone-mapping "turned on"
With auto tone-mapping "turned off"
Pay attention to the red hues of the helicopter's chasis and the highlights of the azure blue sky. The MaxCLL is 970 nits (brightest pixels in this episode) while the MaxFALL is 269 nits (average light output within a frame). The wider the difference, the more drastic is the picture tone (bright or dim picture) between a bright and dark scenes. This is the problem with static metadata. Dynamic metadata is preferred but JVC projectors (regardless of the models) will not be able to do it "dynamically" across each frames but rather, we have to rely on the source (e.g. Panasonic HDR Optimizer) or the use of MadVR filter on a HTPC to send over the "dynamic metadata" across to JVC projector. I dun want to say "I told you so" but I remember saying "what if the hyped auto tone mapping fails to live up to expectation"
If I read your comments correctly, JVC is using the static metadata to do re-mapping ? btw do you have Meg 4k ? the max is 10,000 nits if I remember correctly. You are really supposed to be glared. See how JVC tone map this ? Frame by frame dynamic tone mapping is almost like a frame by frame re-encode, not to mention there are plenty of incorrectly flagged metadata. It's not a simple map lookup. Are you beginning to become a believer that such ops should be done at source ? htpc or a SoC player ? (because it can store the previous frame/look ahead the next frame to compute/guesstimate the proper range) It's almost like old dvd days, plenty of encoding errors/shortcomings requires player to do line by line correction by itself ("chroma upsampling error" and "motion adaptive compensation" remember). Actually just taking out the tone mapping "feature" that doesn't work, the JVC N is still a good 4k PJ. Now it's a fairer comparism between this and the Sony 4ks. You can then talk about contrast, brightness, sharpness, motion handling, etc. One thing I personally felt is, Sony is somehow sharper than JVC, and somehow has smoother motion than JVC, but JVC has higher contrast. If I don't get the projector in first and then try out this "feature" called auto tone-mapping on the JVC N series projector, you and I will never know whether it works or not. It is one thing to speculate, read from other people's experiences and another if you literally try it for yourselves and provide an affirmative answer to it. I wouldn't say it is a complete failure for JVC auto tone-mapping. There are some redeeming quality in certain areas but I am not going to great details here. The problem with JVC's very own tone mapping is that the performance fluctuates with different content, be it 4K UHD discs or streaming a 4K movie from Amazon Prime Video or Netflix. If a product didn't fare well, you can be sure that I will report factually even though I owned the product. The idea is to let members know what they are buying so that they can tamper their expectations to a more realistic level (avoid huge disappointments). And yes, "dynamic" metadata as opposed to static ones is the way to go for ALL projectors that does HDR and that also include laser-based projector, not just lamp-based ones like the JVC N series. As long as we go anything beyond 120" image size, tone mapping is MANDATORY but it appears that source-based tone mapping is indeed a better approach in this scenario. As I have not see the latest Sony 4K in action, I will reserve my comments on the sharpness and details but what I can tell you and everyone is that the image is sharp because this is JVC's first true native 4K panel instead of a native 1080p panel. But Sony definitely handles motion way much better than JVC (no doubt in my mind) as the Clear Motion Drive (CMD) of JVC is a total joke! Take note that I am basing my comparison based on my previous flagship Sony projector (VW500ES). JVC for this year has improved its DI a lot which really enhance the perceived Contrast ratio on screen, especially on 4K (SDR).